I was under the direct lead of Dr Souha Shehadeh, Paediatric Psychiatrist, and head of the Mental Health Team. I was supported throughout the 10 weeks by Sawsan Eweineh, the Education Officer, who worked as my translator and co-therapist and I am immensely grateful to both Sawsan and Souha for their encouragement and help. I undertook a variety of clinical work in several settings and working with differing aims as suited the client. "Overlying all of the diagnosed problems the children have are the problems of trauma and challenging ongoing living environments, and these had to be taken into account in all of my work and clinical process." The main body of my work was in two schools closely linked to BASR; El Khader Rehabilitation Centre and Obedieh Rehabilitation Centre. Both of these schools were originally set-up by BASR to encourage integrated primary-level mainstream and special needs education. Most of the children with developmental needs could be described as being somewhere on the Autistic Spectrum. Overlying all of the diagnosed problems the children have are the problems of trauma and challenging ongoing living environments, and these had to be taken into account in all of my work and clinical process. Regular and ongoing support is given to both schools by members of the mental health team who visit at least once a week to carry out individual and group work. At the end of the session we also made a space to hand back all of the instruments and take part in a count down activity - here a chart comprised of a train engine and eight carriages velcro’ed to a large sheet of cardboard - one carriage for each session. Every child was invited to take the carriage for that week off the card, therefore helping them understand the diminishing number of sessions and that this work would be ending. "Alia had changed from being a young girl who was isolated and withdrawn, unable to cope with change or interact with others, to one who had a place with her peers in the group and was able to express some of her emotional world." Alia was a member of a group at El Khader. Alia was unable to take part in normal class activities, and expressed great anxiety at the thought of separation from her mother. In music therapy sessions, she was a little more able to experience ‘normal’ social and school life. For the first two sessions that Alia attended she was only able to remain in the group for up to 10 minutes and screamed loudly for the majority of that time. Alia would pause from screaming when she was approached by me with a drum or other musical instrument, beat it in the pulse of the on-going music, and then resume her screaming. In the second session Alia was carrying a doll and, after she had beaten the drum, I took the doll’s hand and beat the drum as well. Alia stopped and looked at the hand of the doll and then at the drum - something had changed - she then started screaming again. After discussing Alia’s inability to stay in the group with Sawsan, Sawsan talked to Alia's mother. Alia’s mother then spent time preparing her for being in the group on the morning of the third session. Alia was able to come to the group without her mother and sit on a chair in the circle. As the weeks progressed, Alia changed from non-participation and remaining withdrawn from the group, to choosing an instrument and exploring it in a sensory rather than musical way, to using vocalisations to respond to the hello song and initiating contact with me and others, playing co-operatively for short periods and, in the final session, approaching me, strumming the guitar strings and saying ‘Hello Musica’. In the final session, Alia was also able to take part in a stop/start music game led by other members of the group, demonstrating that she had a good ability to focus on a task and the knowledge that she was part of a group. Alia had changed from being a young girl who was isolated and withdrawn, unable to cope with change or interact with others, to one who had a place with her peers in the group and was able to express some of her emotional world. I am delighted that some of this work is continuing in one of the schools. Using skills that she picked up while working as co-therapist in our sessions, Sawsan has been running individual sessions with one child who found being in a group very challenging. Working with her team’s and my support, Sawsan has been able to use music for form a strong trusting relationship with this child and help him begin to communicate both verbally and using music and dancing to express himself. Sawsan is also using music in general nore widely in her work with children who are linked to the Mental Health team. I will continue to stay in touch with Sawsan through Skype sessions and written reports to support this work. I led a music experiential group twice for a group of up to 12 teenage boys in Beit Omar. This group is led by a psychologist from Medcins du Monde, who have a network of professionals in the area. All members of the group are ex-detainees of the Israeli Defence Force. Their experience of trauma and existential threat is real. The two sessions I led focussed on ‘being heard’ and ‘listening’ using music as a tool to illustrate these phenomena. The members of the group took up the use of music as a way of expressing their feelings quickly and spoke about how they had found the sessions useful. General Presence on the ward. When I was on the ward for therapy sessions, I took time to visit the children and staff, and generally initiated some form of musical interaction with children by their bedsides or in the corridor. This made my presence as a therapist more acceptable to the children and was a good way of building relationships with them, their carers and the staff. An example of this was encouraging a little girl who was struggling to use her walking frame to walk the length of the corridor in order to have a turn playing on the guitar which I was singing to. The Speech and Language Therapy department referred four 4 year old boys for group music therapy. All boys have a diagnosis of autism and have delayed speech at some level. Sessions were held in a room in the Education Suite opposite the Mental Health team’s offices. We decided to run a family therapy group and focus on encouraging and supporting interaction and early speech development between family members and between the children. We held six sessions and used the Hello and Goodbye songs and the train count down chart to help them understand the boundaries of the sessions. We worked on very early stage speech and language, with call and response and turn-taking as a basis of the sessions, and using blown instruments such as kazoo’s as a way to encourage the children to develop their vocal skills. As the weeks progressed we saw positive changes for the boys; they were able to engage in ‘conversations’ with their parents and other members of the group and to play alongside each other from time to time. I was involved with the delivery of a music hour for the educational group which meets for two hours every Friday. This group (6 to 12 in number) is open to children in the community, and also takes children who have been referred through the mental health team. It is a good environment for children facing various psychological challenges to interact with others in a safe and supportive space. The music group was not intended to be a therapeutic session and focussed more on games and singing without having aims beyond this. As the group progressed there were instances when it was apparent that music was having emotional impact on some of the children in the group. One child in particular expressed grief and distress during sessions, part of which was addressed by music therapy intervention, and her case has now been discussed at the weekly staff review meeting and highlighted to her care team who are endeavouring to arrange further support for her. The team felt that the music had helped the child open up about her feelings and that this had given them the opportunity to contact her carers and discuss her case in greater depth. I worked on an individual basis with one 8 year old boy who had suffered a catastrophic brain injury at home two months before therapy began, leaving him quadriplegic, blind and with a gastrostomy and tracheostomy (which effectively left him unable to vocalise). It was thought that he was receptive to sound and pain - any touch would result in his face displaying stereotypical pain characteristics. He was attended daily by his father or grandfather. I saw him twice a week for 30 minute sessions over five weeks, working on ways in which to reduce his isolation and give him an opportunity to express himself through my musical reflection of his facial movements. He had occasional non-intentional movement in his legs, so I set up the wind chimes at his feet which would sound if he moved, I would then react to that sound. I focussed on song, repetitions of his name and any pertinent facts, to help him be aware that the music was directed at him and was for him. On one occasion his mother was present and participated in the session, speaking to her son and caressing him - interestingly the only time when touch did not seem to cause him pain. Being able to facilitate a continuing relationship between this child and his family members through the use of music was, I feel, key. This was detailed work, often having very little obvious outcome, but, as sound seemed to be the only sense which gave him any sort of connection with the outside world, I felt that it was important to work with him as much as possible. On my arrival at BASR, I carried out an audit of the musical resources already in place, sorted out more suitable and accessible storage of them and created a photographic catalogue of what was here. There was already agreement from ABCD to fund the purchase of a quantity of new instruments. In agreement with the team I reduced the size of the order and liaised with Claire Tillotson in the UK to arrange the purchase of additional instruments to be brought out by the ABCD team in November. This decision was partly because the West Bank supplier was unable to fulfil some of the revised order, and partly to equip the various departments using music with high quality, long-lasting instruments, which would produce clear and nuanced sounds more able to reflect the user’s emotional expression - a core aspect of music therapy and a distinct difference between running a general music fun session and working at a deeper psychological level. I carried out a 45 minute training/discussion with representatives of each team in the hospital covering various aspects of safety (what instruments to choose for different environments and the various ways in which one had to be mindful of the risk of physical harm when using them), hygiene (cleaning of instruments after use and minimising the risk of spreading infection through touch or transfer of bodily fluids such as saliva) and basic repairs to instruments to keep them fit for purpose for as long as possible. 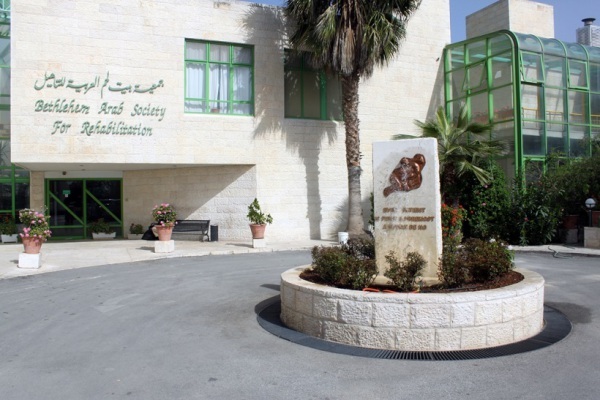 I would like to thank Souha Shehadeh for her professional support and advice and for her personal welcome and support - all of which made my time in Beit Jala such an enriching one. I would like to thank Sawsan Eweineh for her support in co-facilitating so much of this work and acting as my translator. 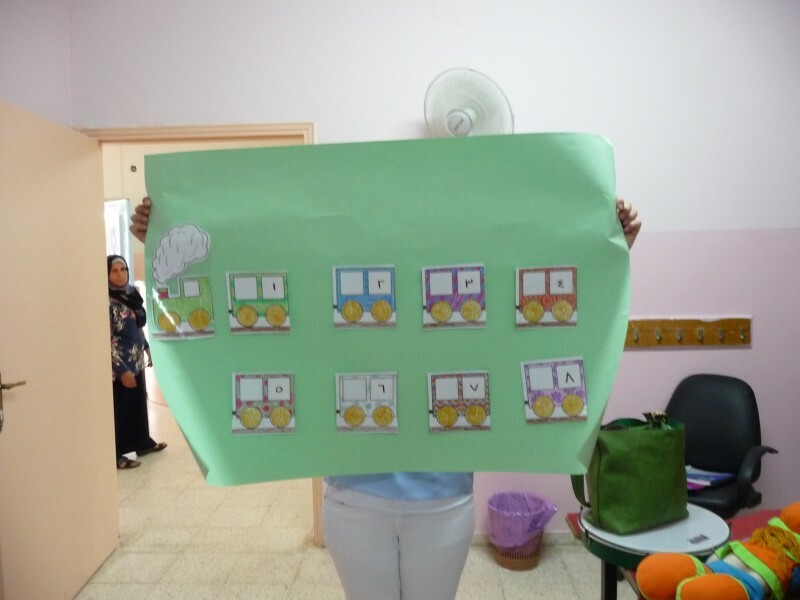 Without Sawsan the benefits which the children got from this project would have been substantially lessened. I would like to thank the rest of the mental health team for their positive and welcoming attitude to this intrusion on their normal work schedules - it has been a pleasure collaborating with them all. I extend my thanks to all the staff at the hospital who made my time here easier - Mary Matta who managed my stay and all logistical issues, the Kitchen and Laundry staff who kept things on the road, and the clinicians with whom I worked. Their unfailing welcome and kindness made this project so much easier than it might have been. I would also like to thank my clinical supervisor, Claire Tillotson, who gave so much more than clinical support and advice, and without whom my work here would not have been so fruitful. Finally, I would like to express my deep gratitude to ABCD for giving me the opportunity to come and work in Palestine. It was a great way for me to broaden my experience and develop new skills, and a wonderful experience living in Beit Jala for a short while. I do hope that the work I was able to do has had a beneficial effect on the children in therapy and am delighted that Sawsan is now going to carry on promoting greater musical involvement in schools and supporting her colleagues based in the hospital in their use of music in their work. I am also pleased that ABCD has put in place appropriate support for Sawsan to call upon when she needs it. There were of course physical and psychological challenges, but I hope that these will have allowed me to experience the deeper emotional and intellectual resources that lie within me and us all. On a personal note, it was a perfect way for me to begin my professional career as a music therapist; working where there is such clear need and being able to give thanks for this new phase in my life in the home of my faith. I will never forget it, and am delighted that I continue to have close links with ABCD and BASR.